If you are beginning the rather overwhelming college admissions process in hopes that the committee will give you a chance to attend your top school choice, one of the most common questions in how to maximize the impact of your extra-curricular activities on a college application. While it is clear that admissions officers do heavily weigh academic performance and test scores, these numbers are not always the sole indicators to determine your potential at leading a successful college career on their campus. In fact, admissions committees often search for the applicants that demonstrate good moral character, strong leadership abilities, and a determination to be involved in school or community activities outside the classroom. Since colleges want to attract well-rounded students who will have pride in being part of their campus community, read on to learn which types of extra-curricular activities you should include on a college application to have the best chance at receiving an acceptance letter from your dream school. As the majority of applications at four-year college and universities inquire about an applicant’s extra-curricular activity involvements outside of the classroom, it is no surprise that admissions officers are strongly interested in what you have a passion about and a dedication for. 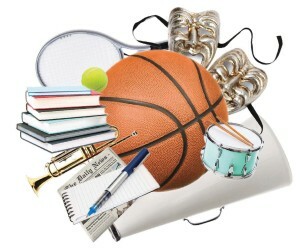 Extra-curricular activities are defined as any activities outside a student’s regular academic coursework, ranging anywhere from drama and sports to music and school newspaper. While there is no one activity that is better than the rest and guarantees you will get accepted into college, community service is a great way to demonstrate that you are interested in giving back. Rather than focusing on the specific types of extra-curricular activities, admissions committees often look for patterns of involvement weaving together to truly demonstrate who you are. Although it may seem beneficial to list every minor activity you have been involved in for the last decade, this is not usually the case. Admissions officers want to learn about the meaningful activities that you have been consistently involved in for a long while. College admissions boards are much more likely to be impressed by having a deep involvement in a few certain activities to demonstrate your interests, talents, skills, knowledge, and dedication. Even if you are not a world-famous musician, athletic sports star, or creative journalist while still in high school, it is more important to demonstrate your commitment to something other than schoolwork to impress college admissions officers. Instead of making a laundry list jam-packed with every activity you participate in outside of school, remember that quality of activities is more important than quantity and prioritize the activities to showcase your best traits. If you have been involved with an extra-curricular activity that is connected to your chosen major, be sure to include this to showcase your head-start on a future career. Whether it is teamwork, perseverance, personal talents, or community spirit, always make sure that the extra-curricular activities on a college application truly reflect you. Overall, it is important to realize that college is not only for students with a perfect grade point average and astoundingly high standardized test scores. Since college exists to educate individuals from diverse backgrounds, extra-curricular activities are vital for showcasing your own unique talents that make you stand out from the crowd. When choosing extra-curricular activities on a college application, be sure to let your own unique character and personality show through your involvement in what you love to do!